The evolution of consciousness on the planet earth – originating with protozoa, fungi and bacteria and manifesting in plants and complex organisms – has been occurring for billions of years. The diversity and rate of change within these realms is enormous. For instance, nearly one million known species of insects continually mutate, adapt and increase their range of dominion. As they find food, adapt to new environments or transform completely, they gain a foothold in the whole process of becoming. Analysing in this way one could say that the planet earth is a great laboratory for the experimentation and evolution of consciousness. Considering this, I will at this time do a very short synopsis or time line of evolution from our present day perspective in order to get a better sense of what our next steps may be. When we look at the human being in this process of change, we see that we have certain unique qualities. For instance on a physical level, of all the animals on the planet we are in some ways the most mediocre. We do not have the strength of the gorilla, the capacity of an eagle to see, nor the ability of a dog to smell. When we look at ourselves in this way, one might wonder how we have evolved to be the dominant species. Yet when we recognise we have one faculty that far exceeds other species – the ability to question and examine ourselves – it becomes apparent. This ‘self awareness’ is expressed in many different ways but is most dramatically seen in language and communication. At this stage in evolution it is the human being that has taken the awareness of separation and comparison to its highest degree. Our libraries are filled with millions of attempts to define and compare nuances of outer and inner perception. If we did not have introspection or self-awareness it is doubtful we would have evolved the ability to dissect and analyse our experience to this extent. For those who doubt that consciousness is evolving the study of language should dispel it. If we examine a given language over many generations we see how the meanings of words change or evolve over time. We also witness the creation of new words and how the complexity of language is increasing. We should realise that this process will continue and at an ever-increasing rate, especially as a global awareness emerges. Language is our collective consciousness. It evolves in a multidimensional way and is not linear in the sense that it cannot be predetermined or controlled by an individual, group or institution. Since the beginning of human history we have struggled to unravel the mystery of human nature – trying to find out what or who we are. In recent years science and technology have contributed great insights into these questions. For example, the latest genetic experiments suggest that we differ from the chimpanzee in only 1.2 percent of our active genes. Genetically we are different from chimps by a very small degree and yet it is obvious that there is a great difference between human society and the society of the chimpanzee. As a species, we have been able to survive in many different environments. We live in the tropics, polar regions, mountainous areas, deserts, on the ocean and it is almost certain, if we continue to evolve, we will colonise space – learning to live on different planets and in space itself. In the future we may look at this century and realise that the most significant thing that occurred is that we as a species were able to leave the planet and begin the exploration of space. Other higher primates do not demonstrate this peculiar need to increase their range of mastery. Yet when I sit next to a chimp, gaze into his eyes and communicate with him through touch and sign language it is very difficult to dispel the perception that I am communicating with another person. Chimpanzees express sorrow and joy, they have a sense of humour and they have a sense of right and wrong. They can use language to tell us about themselves, about what they value and what they need. They communicate about being lonely and wanting contact and love. When I hold a baby chimpanzee in my lap my parental instincts are evoked and it is very clear on an experiential level we are much more alike than we are different. Our ability as humans to reflect upon ourselves and ask questions about our origin has evolved to a very high degree. When we look at the human story, at least at present, we can see our species evolving for around six million years. Most of that time is shrouded in mystery. Historians can only look back a few thousand years to the dawn of writing and recorded history. Archaeologists go back a little further digging up the remains of ancient civilisations. Beyond that we only have a glimmer of what might have been – a few stone tools or more recently a few clues from our DNA. This evidence indicates that modern humans evolved in Africa around 150,000 to 200,000 years ago. We have discovered it is at that time in history when the hominid developed a distinctive physiology and behaviour. From around 60,000 years ago Homo sapiens migrated from Africa in waves spreading across the planet replacing other like species so that only hominid remained. Another leap occurred in Europe around 40,000 years ago with the emergence of Cro-Magnon, a type of Homo sapiens. They seemed to demonstrate much of the modern anatomy, society and behaviour of what we know to be human. Their society in some ways was so sophisticated that some archaeologists call this stage the great leap forward. In the next 30,000 years, consciousness, in the form of Homo sapiens, evolved more quickly than in the previous 6,000,000. Dramatic progress in mythology, art, music, religion, trade, clothing, housing and tools occurred. The advent of writing signalled another great leap in consciousness for our species. Using the written word to communicate information about survival and unfoldment to future generations was a tremendous advancement. Prior to this, we depended upon stories from our elders. This was an incredibly fragile and tenuous link to the past as it could be so easily lost through the happenstance of nature. A volcanic eruption could wipe out an entire community, disease could decimate a population in a matter of a year or a war could destroy an entire culture or race. It is not that writing ensures against this loss but it does give us the basis of transmission that transcends the boundaries of small, ancestral cultures. First, the development of speech profoundly distinguished humans. This was followed by writing and now many believe the development of technology, specifically computers, is again providing a platform for the human species to take another leap. Recently, scientists have discovered the great malleability of the brain. We call this neuroplasticity. What has yet to be completely understood about this process is that computers and global communication will transform the brain structures in radically different ways. Until about 10,000 BC the flowering of consciousness was very gradual, then the changing climate at the end of the last ice age offered new possibilities to unfold. Agriculture emerged and irrigation technology developed; new types of grains and cereals were cultivated and new methods for storing surplus were invented. Human beings migrated and settled along the waterways of the planet. This led to the development of large sustainable communities and eventually to what we know to be the city or state. In what is now Japan, archaeologists discovered pottery dating from around 10,000 BC. Around 9000 BC we see the cultivation of wheat and about 8000 years ago the domestication of goats, sheep and other animals in China. Jericho, the first walled city – discovered in what is now Israel – dates back 7,500 years. Through this development of the collective we can understand that the human being created a profound separation from other sentient life. At around 1500 BC, the first metal work appeared in Peru and from this of course many things changed for the human being. In different pockets all over the world humans were making similar breakthroughs and developed social structures that were distinct from other sentient life. They all however, had one thing in common – the desire to master and control their environment. No other species has expended that much energy and effort to dominate others and manipulate their environment. At around 850 BC, the Greek society emerged. The use of metal, mastery of the sea, the development of commerce and the use of money as a means of exchange all began to appear about the same time in different places around the world. Accounting was present in early Egyptian society and some believe that this is when our first alphabet emerged. The use of hieroglyphs, signs and symbols to record the storage of grain and the transfer of commodities appeared. We see that with the human being’s interest in abstract forms of thought, mathematics and architecture gradually gained importance. At this time in history we can see the emergence of the great experiment we know to be human society. As collective groups developed prosperity, science and technology started to emerge. As a co-operative species, the greatest development in consciousness occurred with the emergence of political and civil society. Religion was an important factor in society from as early as 28,000 years ago. The evidence for this was found in Sungir, Russia with the discovery of Cro-Magnon burial mounds containing elaborate beadwork made from ivory. This suggests that the people of that time had a sense that in death there began another journey. All over the world different religions provided the structures through which the collective ideal could be expressed. This served the very important function of uniting ever-increasing numbers of people on a collective level. Each of the different religious forms that emerged over time has performed this function. It will be very interesting to see the structures that emerge in the future that will be able to unite the collective consciousness of our species. At the present time traditional religions, when seen from a planetary view, are a divisive element creating hostility. This I believe is a betrayal of their original function. If we examine the process of history we see how various groups emerged as being the fulcrum of experimentation and change that we would later collectively embrace – the beginning of the Olympic games, the use of money in Asia Minor and the emergence of the Assyrian Empire. Homer’s poetry and the Olympics show how people celebrated the heroic ideal. At about 560 BC, the collective development of the human being was predisposed towards certain types of mastery such as engineering, mathematics and other analytical fields. These forms distinctly marked our species as unique. It is at this time that the Buddha was born in what we now know to be Nepal or Northern India. The Egyptian culture was highly evolved, the Greek culture was beginning to emerge, in China social philosophies were developing and in Central America we were developing astronomy and a calendar. All over the planet humans were engaged in the development of science, agriculture and social orders. We see the unique question posing of our species occurring in many forms. It is here at this timeline in history that we come to the subject of this book – the teachings of Sakyamuni Buddha as preserved in the Tipitaka and transmitted for the last 2500 years by masters of the discipline. In our culture today we see the results of humanity’s efforts to evolve; some we may celebrate and others we may lament. Certainly, the emergence of science and technology has brought great advantage, but also great peril. In this book, I have attempted to present a clear and accurate representation of the Buddha’s teaching on the cultivation of consciousness. You will find within its pages exercises and practices for the development and elevation of consciousness. In some ways these ancient teachings have never been equalled – they hold the possibility of the emergence of super consciousness. I believe the attainment of this ideal has never been more possible, at least in terms of a large number of people achieving it. Because of the great wealth and prosperity on the planet today, it is possible an enlightened society could emerge. In some sense it could be said that unless an enlightened society does emerge we might become the great failed experiment. Our development as human beings is tenuous at best. A not too drastic change in climatic conditions could be the end of our species. The collapse of our global economy could trigger starvation and epidemics. We see signs of change on every level and there is no assurance anywhere that we will succeed in coping with the new challenges. If we do in fact continue to evolve, we will have to become conscious participants in this process. Up until now, we have stumbled along merely looking at the road a few feet ahead. In this way we solved problems necessary for our survival, however, this form of adaptation is no longer viable. Because we as a species have had such a huge impact on our environment, and this has only taken place in the last two hundred years, we must now consider the whole of sentient life rather than just our small and selfish group. To me it is in considering the totality of sentient life that the Buddha’s teaching has great pertinence and value. Our resources on the planet are limited and finite, but our growth in population is not. Because of this disparity, we have to consider how best to use our resources. In the past, individuals and nations succeeded through military conquest and the hoarding of wealth. I believe we are coming to the end of this type of development. In our present world, this is not a viable strategy for success. Because when large numbers of people are disenfranchised, starving, or enslaved, such imbalance in quality of life brings with it the potential for violent revolution and epidemic disease. It is no longer possible within our present worldview to contain these highly destructive elements. The rise of terrorism is a perfect weapon to defeat global imperialism. It is no accident that this form of warfare has emerged. When a culture and way of life is threatened with extinction, large groups of people become hopeless, radical and desperate. On the other hand, the disintegration of the fabric of wealthy nations comes from a lack of social continuity. Witness the types of crimes that have recently manifested in North America; inexplicable acts of violence, drug addiction and high suicide rates reveal the disenfranchisement young people experience. The en masse institutionalisation of education is proving to be one of the most destructive forces in today’s society. Lack of time spent in the extended family and lack of continuity of care increase disassociated behaviour. Such behaviour can not be explained unless we consider how dehumanised our society has become. Some may say that we have evolved too quickly. The bonds between parent and child severed too early have left us with a way of life that is truly bleak. By comparison to many of the past epochs of our evolution the emerging society has the potential of becoming an imprisonment of consciousness rather than a platform for the extension of consciousness into the universe. However, one thing is certain, we can never go back to an earlier stage of development. We can only go forward, and in doing so, we must lift our eyes to a higher horizon. Selfish, manipulative and nationalistic views block our progress. Only by recognising our interdependence and interconnectedness will we be able to evolve to the next stage. So long as individuals and small groups struggle for survival by indiscriminately exploiting the environment or other individuals, we all teeter on the edge of global disaster. When our gluttonous consumption of fossil fuels depletes the ozone layer, we all experience the toxic effects. As long as global warming continues due to these emissions, we all experience the result. When there is starvation and epidemics in Africa or other places in the world, we all run the risk of it spreading out of control. Some scientists believe we have already past the point of being able to reverse the devastating effects of our activities. Whether this is true or not, we will discover in a few years to come. Looking at humanities present situation, it should be clear that any strategy for survival must take into account our interdependence with all of life or it hasn’t even a remote possibility of success. It is at this time that we begin to see if it is possible for the human species to evolve to a new level of consciousness. This is a great turning point in history. In order for this new level to emerge, we must go against all of the selfish strategies that have served evolution in the past. We must transcend our instinctual desire to protect ourselves, families, communities or our nations by exploiting others. Given the present state on this planet, this may be the only thing that ensures the continuation of our survival. It is here that we are tested to our very marrow as a species. Do we have the intelligence to see the ramifications of continuing to function under the illusion of separateness? Can we make the quantum leap into the realisation of universal consciousness? This brings us to the importance of the Buddha’s teachings. Because in it the development of consciousness satisfies our need for empirical experimentation and verification, and because it focuses on techniques or skilful means, it can be practised by anyone who chooses to use these techniques. It is not necessary to have a set of beliefs or predetermined worldview. The single most fundamental premise of Buddhadhamma is ‘awareness or mindfulness of what is’ and this is always seen as an ongoing process, never static, predetermined or finite. Certainly, we will never practise these teachings as they did 2500 years ago, nor should we try to do so. The teaching, if it is to be realised, must occur in the present context. This can only happen through direct perception of what is. In our present situation on the planet, this means the realisation of our interconnectedness. Interdependence and interconnectedness are not an ideology but a statement of actuality. We as sentient life can never exist independent or isolated from totality. The Buddha’s teachings are not merely theoretical understandings of consciousness. In some ways they are similar to the scientific method because they emphasise observation and experimentation. In other ways they are dissimilar because they state that we should not accept the results of other peoples observations. In other words, individuals use their body-mind complex as the ground to carry out their personal experiments in the development and cultivation of consciousness. The more we collectively understand the process of awakening the more we will encourage the young to embark on the cultivation of consciousness. If we do not observe and experiment for ourselves, we merely bandy about in the realm of conceptual theories. However good our ideas or beliefs may be, they will remain only ideas and beliefs until we put them to the test. A highly evolved or enlightened consciousness functions in a fundamentally different manner than one that is not. Yet we should not think of enlightenment as an end, but instead as a beginning. Or perhaps it is both. It is the end of self centred isolationism and the beginning of open-ended unfoldment. When we experience this as individuals, we come to the absolute conviction it can be experienced collectively. When our activities arise from this experience, the peaceful and harmonious evolution of consciousness occurs. We are prototypes. Each individual has not only the right to experiment, but also the responsibility to do so. Our right only exists if we claim it. If we take up the discipline of investigating and developing consciousness, we can with certainty create what we will become. If we do not make these conscious efforts, we become the fodder for the haphazard, random and ruthlessly brutal machine of evolution. Without exercising our right of experimentation, we remain trapped in the historical context and can never leap out and experience a view of totality. Some believe this leap is impossible. Others can only imagine it taking place if they project an identity or god outside of the context. Contrary to these views, with direct observation and experimentation we develop a view that leads to transcendence. If there is a purpose to human consciousness, it is to achieve this transcendence. To know for one’s self the origin of consciousness, the cultivation of consciousness and the cessation of consciousness. To know directly for one’s self what is a refined or beautiful mind, what is an ugly vulgar or mean mind and to make value judgements based upon this knowledge. As we investigate our own being, we are transformed by this investigation. As we attain higher levels of consciousness, our view of ourselves and those around us is transformed. One who has not experienced this transformation, by the very nature of diminished consciousness, finds it difficult to imagine. One who trains and cultivates the mind with various forms of wholesome activity rides the crest of the wave of evolution. This is not a selfish indulgence in the bliss of liberation. Instead, it is the culmination of the longing and searching of every individual consciousness that has ever existed. When one being attains awakening, the whole of sentient life experiences and shares, on some level, this transformation. Venerable Sonam Senge is a teacher of awakening in the tradition of his principal teacher, the Venerable Namgyal Rinpoche. Senge, received ordination in the Karma Kagyu tradition from His Holiness the 16th Karmapa. He has also been ordained in the way of the elders (Theravadin Tradition) by Sayadaw U Thila Wanta of Burma. His Eminence Chogye Trichen Rinpoche (of the Sakya tradition) asked Senge to begin giving Wonkurs. Venerable Sonam Senge is an author and artist. 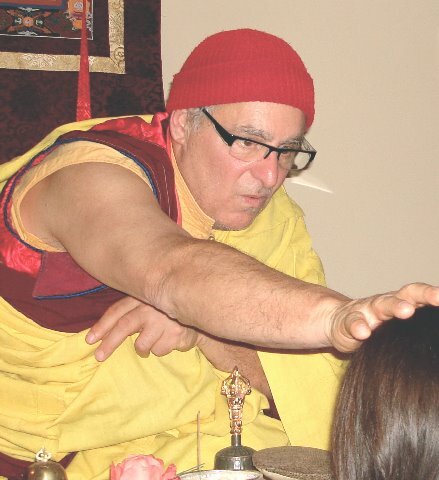 He lives on an island off the coast of British Columbia where he teaches and practises the Dharma.